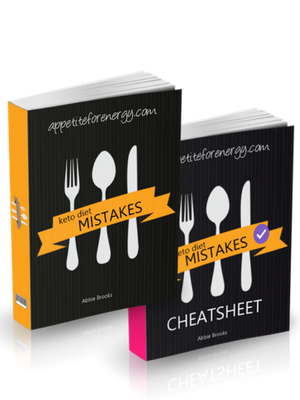 This is Part 3 in the series The Definitive Guide To Keto Mistakes. To start at Part 1, click here. It takes a while to transition to a ketogenic diet. The quicker you try to do it, the more likely you are to have issues. This is because there are a number of trip points that can make or break your results. The quicker you get down to a carbohydrate intake of 20-50g, the more of a shock it will be to your body. It is also difficult to take on some of the subtle principles of the diet which can have a huge impact on how you feel. It also affects whether you stick with the keto lifestyle and get to enjoy its many benefits. Most of the fixes are simple to implement and can have an instant effect on your mood and energy levels. This post explores another 3 common trip-points that come up for ketogenic dieters. 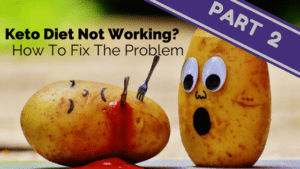 It is part 3 of a series of posts this month, which will cover how to fix some of the common issues people face. If you haven’t seen Part 1 click here or for Part 2 click here. If you have gone through this guide and it’s still not working for you, then it may not be right for you. It won’t suit everyone as we all have different physical and metabolic make-ups. It’s a good idea to be very cautious when drinking alcohol while on a ketogenic diet. 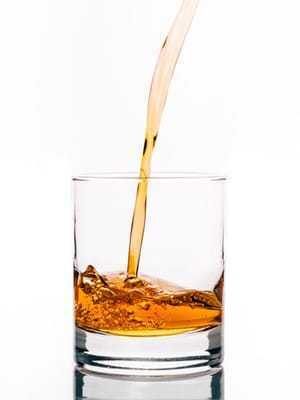 The body will use alcohol as a primary source of fuel so if you consume it, you won’t be using fat as a fuel. Once you’ve used the alcohol as fuel you will go back to fat burning. 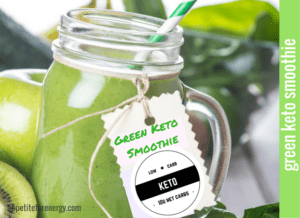 This will reduce the time you spend in ketosis and may affect your weight loss results. If you are trying to lose weight, the best strategy is to avoid alcohol completely. Beer and wine contain carbs (see guide below) so drinking alcohol will make it very difficult to keep your carb intake low. Alcohol tolerance is dramatically reduced on a ketogenic diet. You will probably get intoxicated more quickly than normal. Many people find that they experience hangovers after drinking only small amounts of alcohol so be warned!! Finally, after an alcoholic drink, you may be far more tempted by high-carb food. For those who are eating a higher amount of carbs (50g+ net carbs) you can drink a moderate amount of alcohol. A bit of experimenting will determine what suits you best. As the ketogenic diet reduces alcohol tolerance, you might find that drinking even a small amount of alcohol gives you a much worse hangover than usual (as well as getting drunk quicker). I find that I feel absolutely awful the next day after 1-2 glasses of wine if my net carbs are below 50g per day. If I’m eating 50-100g net carbs per day, then a glass of wine in the evening is fine (and very enjoyable!). Be sure to drink plenty of water if you are going to drink alcohol. Different beverages will have different effects so try out beer v wine v hard liquor and see how you feel. Keep intake low as you are not eating enough carbs to soak up the alcohol and slow absorption. Stick with 1 glass (serve) per day. Beer has the highest amount of carbs per serve (12-18g), followed by light beer (2-7g), dry white wine (3-5g), red wine (3-4g) and champagne (1.5-4g) then spirits (0g). Hard liquor is the best choice mixed with soda water and lemon/lime juice. These spirits have the least sugar and zero carbs however you need to be thoughtful about what you mix them with. 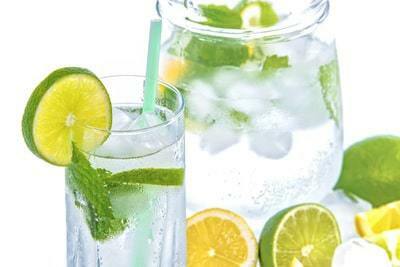 Most mixers have plenty of sugar so try soda water with a squeeze of lemon or lime juice. Champagne and white wine both contain carbs and sugars. A glass of dry white wine (5 fl oz or 150ml) contains 3-5g net carbs. Champagne and sparkling wine can vary in the range of 1-4g net carbs. A typical glass of red wine has up to 4g net carbs. Beer: one bottle (12 oz or 350ml) has 12-18g net carbs. Light beer: one bottle (12 oz or 350ml) has 2-7g net carbs. Use this carb counter to look up carbohydrate counts of other alcoholic drinks. Read our full guide : The Practical Guide To Low-Carb Alcohol for more in-depth information and to download our FREE Low-Carb Alcohol Cheatsheet! Keto Mistake #8 Not Enough Calories Or Too Many? 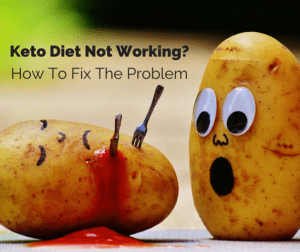 A common cause of the ketogenic diet not working is not getting enough calories. 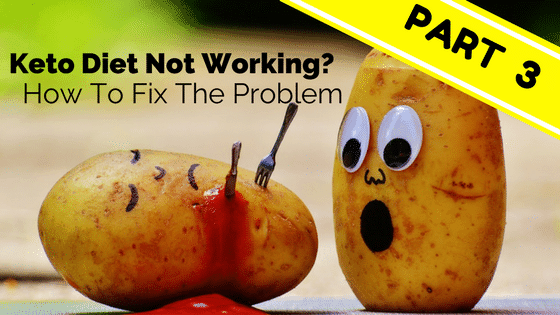 We are so used to eating low-fat diets and trying to consume fewer calories that we can sabotage our weight loss efforts this way. When we start to eat low-carb, high-fat (LCHF), we naturally shy away from high-fat foods because we feel we shouldn’t be eating them. Not eating enough fat, usually leads to calories being too low. When there are not enough calories on a ketogenic diet (or any diet), the body can go into stress mode (particularly for women). This is the body’s way of preventing fertility until more plentiful food is available. The best thing to do is check your macros to ensure that fat is at least 60% of your diet (by calorie). Fat may even need to makeup 85% of your diet to induce ketosis. It’s very difficult to overeat and take in too many calories on a keto diet. This is because of the appetite suppressing effect of the ketogenic diet. When you are not feeling hungry all the time, you naturally eat less. The high-fat in the diet provide a good level of satiety that you don’t get from eating low-fat food. On a keto diet, you shouldn’t have to worry about calories unless you are putting on weight. Gaining weight is fairly uncommon and likely to be caused by carb levels being too high or too many calories. In this case I would recommend tracking daily food intake to check that the keto macros are in line. If they are close to the suggested ketogenic diet macros (see below), then perhaps excess calories are the issue. 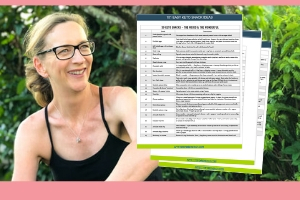 Use a free macro calculator like this one from www.ketodietapp.com to find out the calorie intake you should be aiming for and use a free macro tracking app to monitor your calories. In Summary: Keto Mistake #8 Not Enough Calories Or Too Many? Solution #1 : Track your macros using a free app like MyFitnessPal to ensure your fat % is high enough. Solution #2 : If you are putting on weight, check your ideal calorie intake and macros using this calorie calculator from Ketodietapp.com, then track your daily food intake for a week using a free app like MyFitnessPal. If you’ve started a ketogenic diet before, you know that after a few days you can start to feel pretty awful. You feel tired, your brain is foggy and you might have a slight headache. This is known as keto-flu and is what happens when your electrolyte balance gets out of whack. Electrolytes include magnesium, potassium and sodium. Keto-flu can be minimized if you pro-actively take supplements to support your body as it burns through its glycogen stores and learns to become a fat burner. Most people are magnesium deficient whether they are eating a ketogenic diet or not. It is believed that 56% of the U.S. population is deficient in magnesium. This is thought to be due to soil depletion from farming which means that vegetables are not absorbing enough magnesium from the soil. The main source of magnesium in the diet is dark leafy-green vegetables like spinach and kale. The problem is compounded as diets include more processed foods and less whole-foods rich in magnesium. , headaches, fatigue and insomnia. It can also lead to an abnormally fast heartbeat (heart arrhythmia). When starting a low-carb diet, magnesium is not depleted as much as sodium. Some people, however, experience leg cramps at night and during exercise while eating low-carb. Magnesium supplementation (and potassium) can relieve the cramping. The current RDA (recommended daily allowance) level of magnesium is ~400 mg/day for a healthy adult. 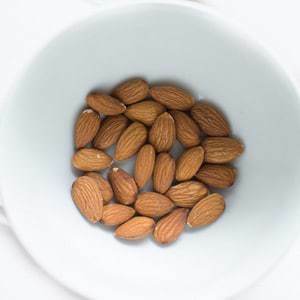 To boost your magnesium with food, include dark green leafy vegetables such as spinach and kale or almonds. Tip: If you suffer from constipation while starting out on keto, taking an extra 500mg of magnesium can help. Another important electrolyte that gets leached out of the body with fluid loss is potassium. It can cause you to feel tired and lethargic if you aren’t getting enough. Inadequate potassium will cause a loss of lean muscle mass. Something you do not want if you are trying to losing weight or at any time! Foods that contain potassium are avocados, spinach, almonds, sesame seeds, mushrooms, kale, walnuts, tuna, broccoli and beef. Unfortunately most supplements come in very small doses so try to get some of your daily requirement from foods. We discussed sodium in Part 1 of this Definitive Guide To Keto Mistakes series as it’s one of the main causes of problems on a keto diet. I mention it again here because it is one of the 3 electrolytes that need attention. If you have blood pressure issues or any health problems, be sure to consult you doctor before increasing salt intake. Sodium is critical while on a ketogenic diet. When carbs are restricted, insulin drops and this causes the body to release sodium. This release of sodium is accompanied by fluid loss which upsets the electrolyte balance. All of this can cause you to feel dehydrated, tired and crappy. So drinking more water is not enough – sodium needs to be replaced as well. I love using Himalayan Sea Salt in my water and also adding it generously to my cooking. Himalayan salt is harvested from ancient sea beds and is far less processed than regular salt which has all sorts of other additives. Solution #3 : Add 1/4 – 1/2 teaspoon salt (fine sea salt or pink Himalayan to a glass of water daily, add extra salt to food and/or drink a cup of bone broth or stock (bouillon) each day. Let us know in the comments what issues you’ve had and what has worked for you? *Walker, A. F., Marakis, G., Christie, S. & Byng, M. Mg citrate found more bioavailable than other Mg preparations in a randomised, double-blind study. Magnesium research : official organ of the International Society for the Development of Research on Magnesium 16, 183-191 (2003). Hi, Abbie. I am 65 and a diabetic. I have been in ketosis for two years. I have completely reversed my diabetes and no longer take Any meds for it. I play lots of tennis and ride my bike. However, I lost 13 pounds in the first year and while sick with a long standing virus, put most of it back on. I have considerable weight to lose. I am frustrated and discouraged! I think I eat too much protein and not enough fat. I try to stay at or under 1400 calories and I use and app to keep track of my macros. Maybe this isn’t the right low carb diet for me with which to lose weight. Any suggestions. Well done for reversing your diabetes! And taking a whole food approach. I can hear your frustration given you are putting in a lot of effort to be healthy. If you are concerned about too much protein and not enough fat, then this should be easy to check as you are already tracking your macros. Macros for keto diet should be around 75% fat, 20% protein and 5% carbs – this is measured by calories, not weight of food. Also, if you’re using MyFitness Pal be aware that it doesn’t measure net carbs, it shows total carbs. This may affect your macro count. I would suggest to start by seeing whether you need to adjust your macros at all as small tweaks here can make a big difference. And perhaps don’t worry about calories for a week or two while you get your macros lined up. Also – make sure you’ve had routine check ups with your doctor to rule out other issues such as thyroid imbalance etc. which can halt weight loss. My final suggestion after doing the above it to try intermittent fasting. Many people have had amazing results with stalled weight loss using this simple technique.